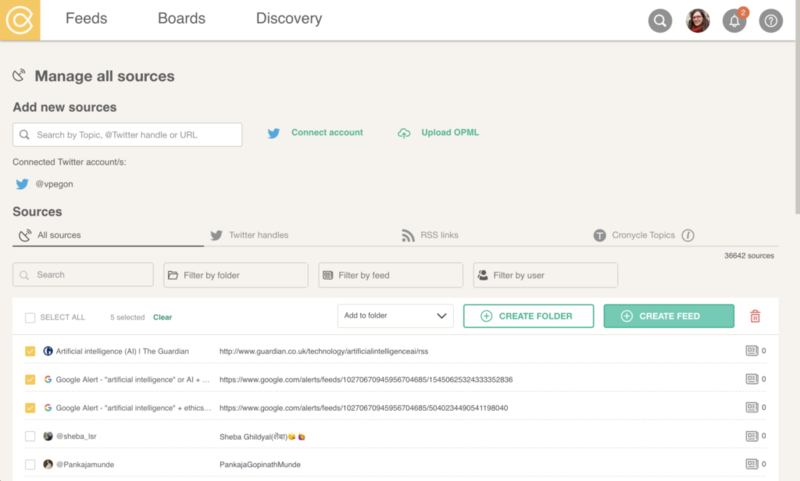 Cronycle lets you integrate the widest range of sources, including Google Alerts into feeds. 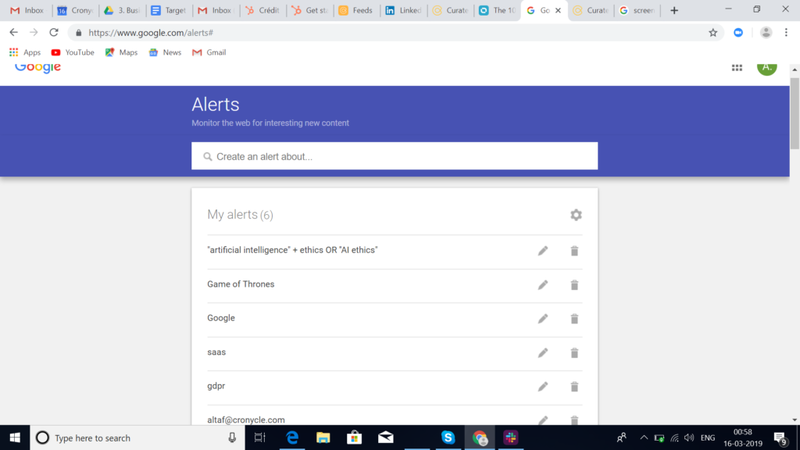 This posts explains how to create a Google Alert and add it to Cronycle. You can use common syntax elements to shape these alerts, such as + to include content with several words, – to do exclusions, “or” to have several options, “quotes” for specific expressions, etc. Read more about more tricks to optimise your Alert here. Click on the pen of the Google Alert you want to follow to show the settings. Select RSS feed in the last option to deliver the alert to. Save to update the alert. Now, when you hide the options, you will see an RSS icon by the alert. 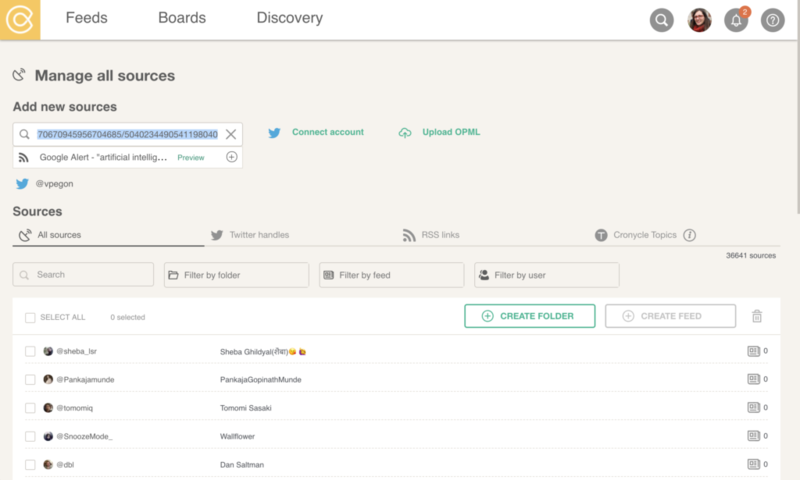 Right click to copy the destination link – a fully working RSS feed URL. Now, you are ready to add this RSS link to Cronycle. 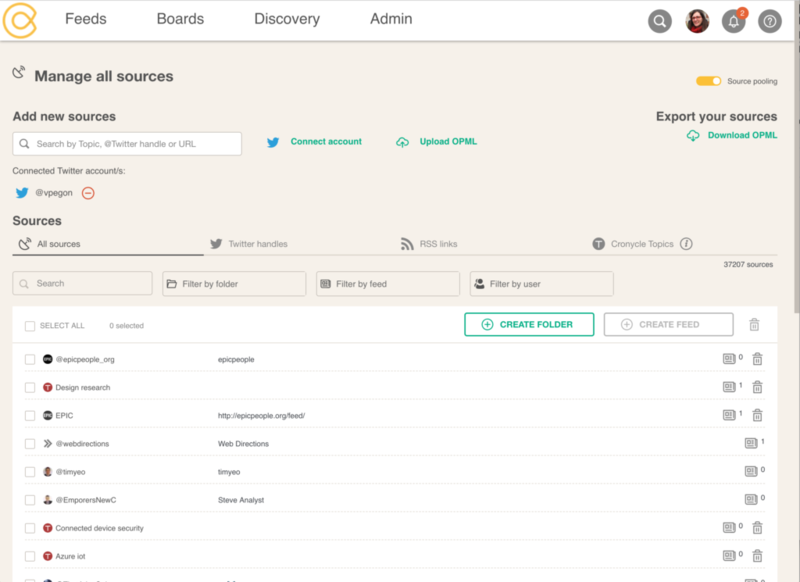 In Feeds, click on Manage All Sources (bottom left). Paste the link in the input field to add new sources: as soon as the alert is loaded, press on the + icon to save it to your source library. It appears in the list of sources, at the top. Next, you probably want to create a feed to see content flowing in from that Google Alert. You can select one or several sources, of different kinds if you want (Twitter handles, RSS, Google Alerts, Topics). Click on “Create Feed” to build your own custom feed. 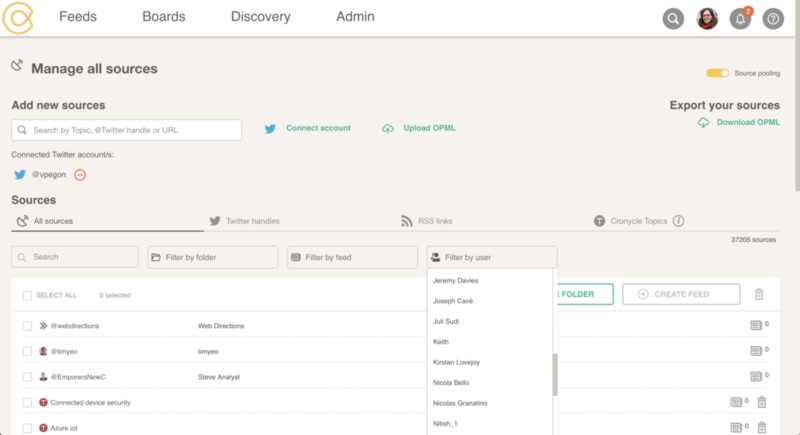 You can also start adding keywords to further refine your feed. 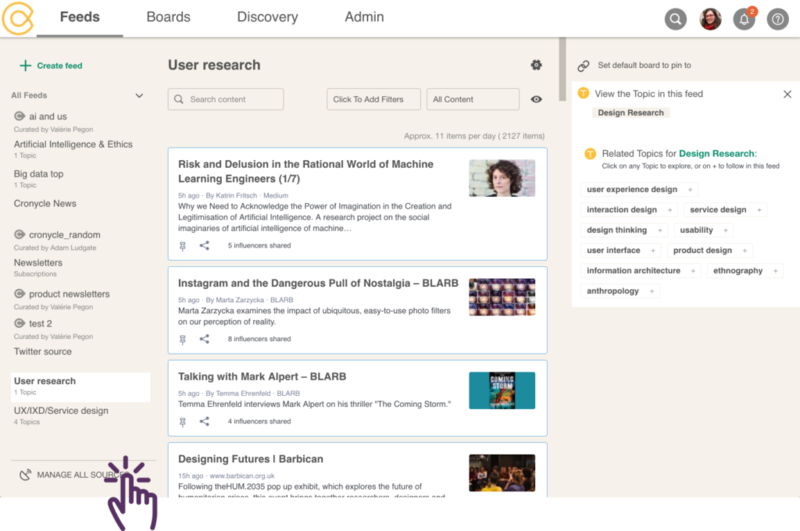 From there, you can pin interesting content to boards and continue the workflow all the way to publishing. The resulting feed. A keywords adds more relevance. 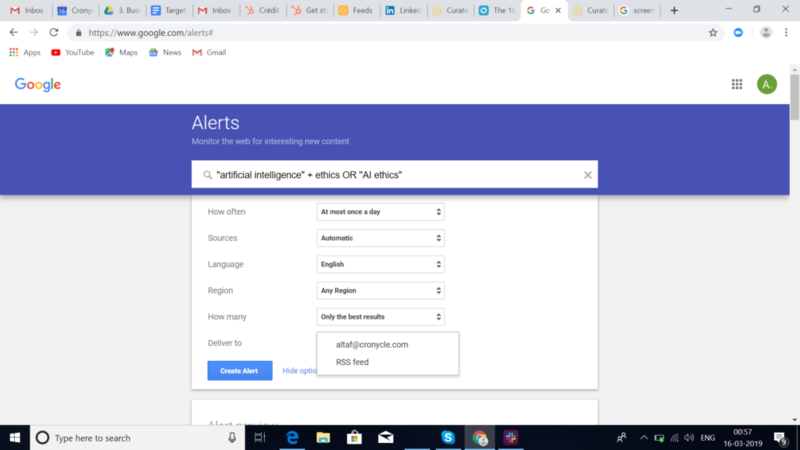 While you can do the above to use your current set up, know that we have an alternative to Google Alerts, which we call Cronycle Topics. Our mission is to help you gain time by surfacing relevant content. 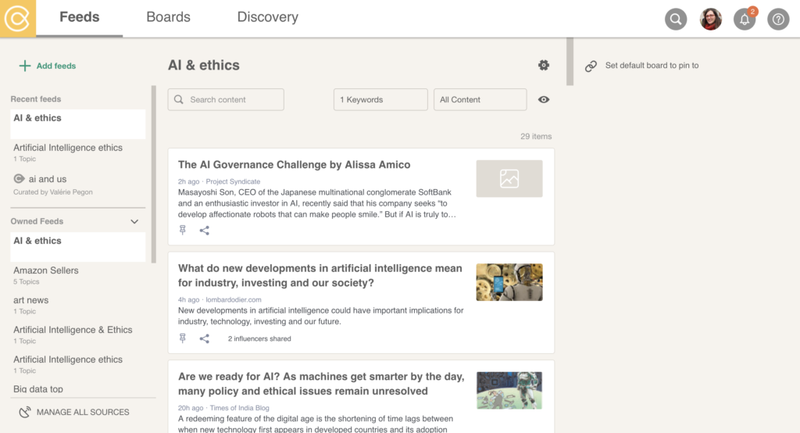 You can search and preview Topics easily in the Discovery section in Cronycle, or from Add/Create Feeds. We identify thought leaders, or influencers, per Topic. They are ranked in terms of influence within the community of the Topic, so we are confident they bring value to the discussion. We look at what these influencers share about the topic on Twitter to surface important and relevant content. You can read more about how this works on this post from Vishal, our CEO. 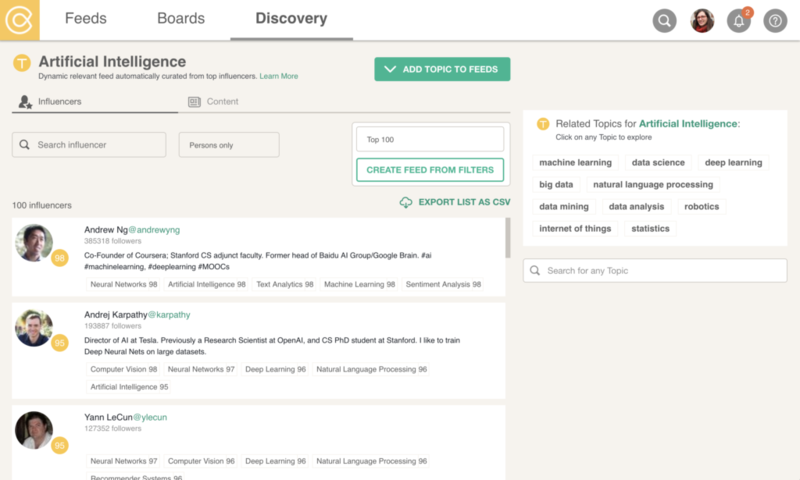 You can add one to five Topics per feed, and add keywords within Cronycle to you can get content at the intersection of some of our 50k Topics and another dimension. 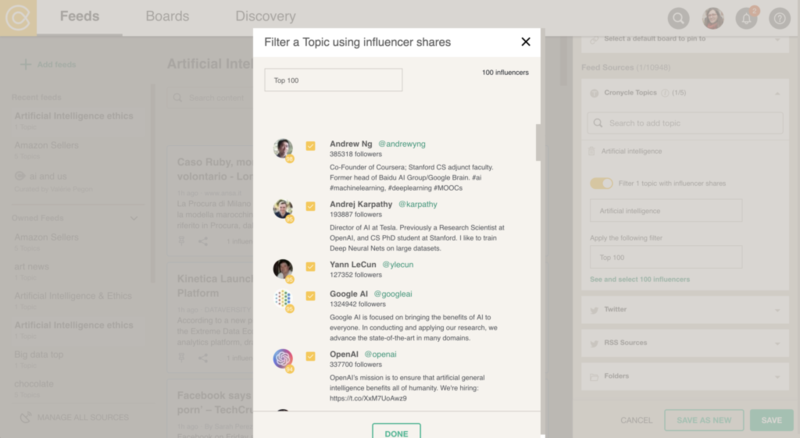 You can also limit the influencers to take in consideration, by deactivating them individually, and/or by selecting a range. To try all this, create an account for free, which gives you all the power of a pro account for 28 days. No credit card required! How do I add my Google Alerts to Cronycle? What’s the future of RSS? 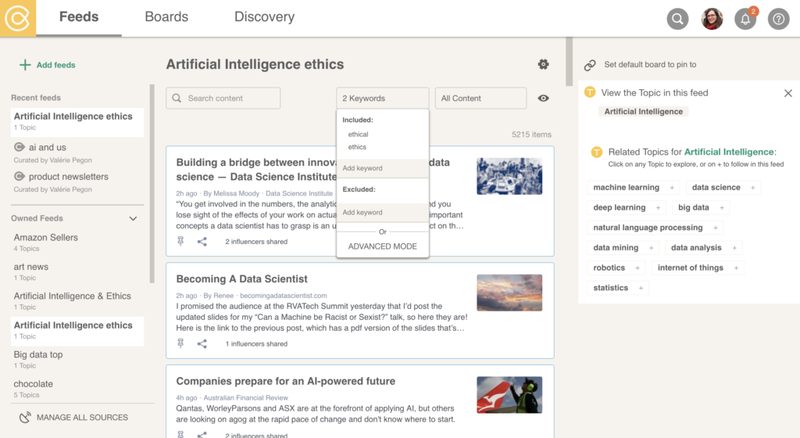 RSS allows publishers to syndicate information automatically, to deliver content right to users’ fingertips. They no longer have to check their favorite sites to see if new content has been published—technology does it for them. But these days, that convenience is commonplace. 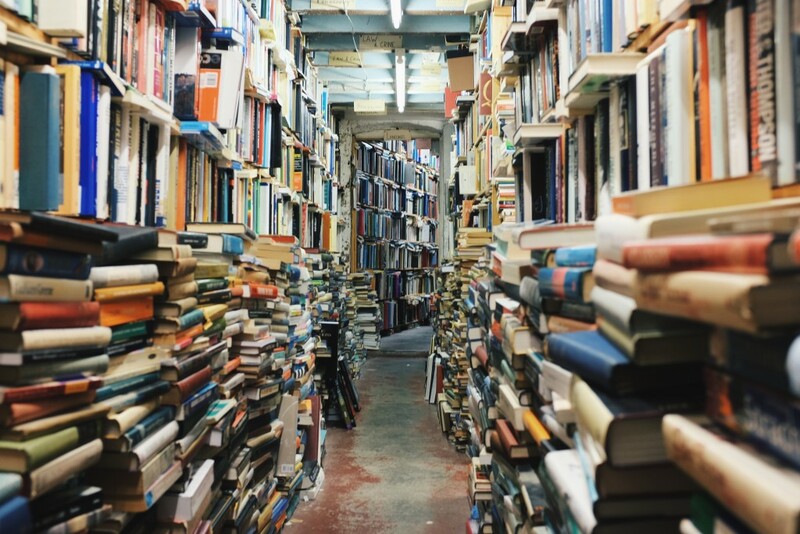 Social media enables an even larger audience not only to receive content from the sites that interest them, but to become publishers themselves. Although few are questioning that RSS has a space in the digital content consumption marketplace, many contend that the space may be shrinking—a theory bolstered by the demise of Google Reader. Google retired its service, which was the most popular RSS reader, on July 1, 2013, explaining, “While the product has a loyal following, over the years usage has declined.” (However, many believe this decision had more to do with office politics and Google’s plans for its own social network, Google+.) A host of worthwhile services, including This Old Reader, Feedly and Flipboard, were ready to take in the millions of Google transplants, but although RSS still has a fierce and loyal following, social media is proving a sufficient alternative for the average user. “We definitely see more publishers using the option for social networks versus the option for RSS,” notes Bruce Ableson, vice president of client solutions at LiveFyre, a tech company that offers a suite of real-time products that allow users to curate content from various sources and host in one place. “We still use RSS Feeds all the time, though, especially at the smaller publisher level,” he says. Although there’s still a huge need for RSS, Ableson notes that publishers seem more incentivized to drive readers to follow them on social networks than to subscribe to their RSS feeds. The problem is, there is a lot of noise to get through. Twitter isn’t only about signifying a new piece of quality content. It’s a hodgepodge of hashtags and interactions, making it difficult for users to quickly identify what’s worth reading. “It makes sense that brands and publishers have embraced Twitter, but whether it does as an effective job as a good RSS consuming platform is another story. I don’t think it does,” Hicks opines. Leave a Comment on What’s the future of RSS?